THE SKINNER: Prador Moon Promotion! This would be good entry level into the Polity for new readers. Prador Moon is on Amazon now for just 99 pence! No idea for how long it will be available at this price. The Polity Collective stretches from Earth Central into the unfathomable reaches of the galactic void. But when the Polity finally encounters alien life in the form of massive, hostile, crablike carnivores known as the Prador, there can only be one outcome – total warfare. Chaos reigns as, caught unawares, the Polity struggles to regain its foothold and transition itself into a military society. Starships clash, planets fall and space stations are overrun. But for Jebel Krong and Moria Salem, trapped at the centre of the action, this war is far more than a mere clash of cultures, far more than technology versus brute force. This war is personal. 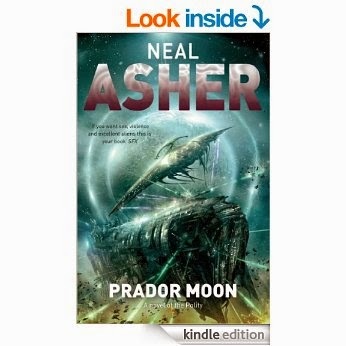 Prador Moon is one of Asher’s most shocking excursions into the Polity's universe of over-the-top violence and explosive action – a vivid, visceral, brilliantly intense space opera that you won’t forget soon. You make me feel sorry I am not in the UK.